You might have seen handmade soap for sale and wondered what the difference is between them and liquid soaps and bar soaps made by big multi-national companies. Surely they must be pretty much the same thing? You might be surprised to find out just how different they are. For a start, much of the bars of soap you see lining the shelves in the shops are not actually soaps at all, but a detergent. Without giving you horrible flashbacks to GCSE chemistry, a true soap is made of a fat and an alkali, whereas a detergent is made from a petroleum base (yes, as in petro chemicals) and synthetic chemicals. 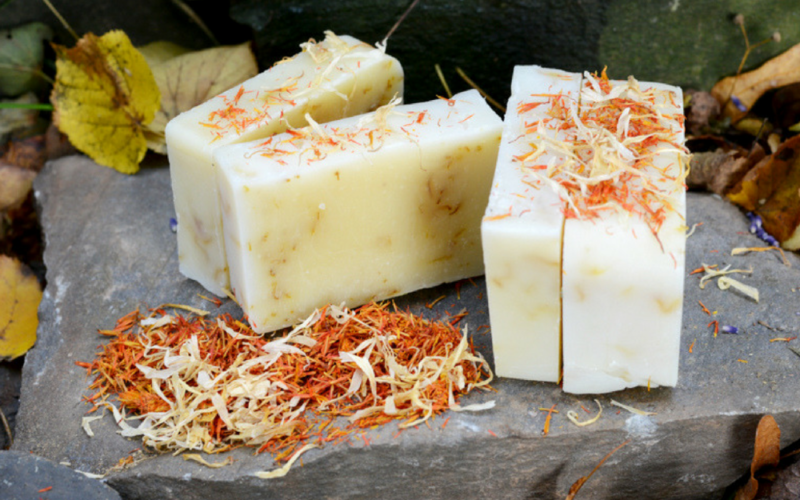 Handmade soaps use plant-based oils such as coconut oil, olive oil, rice bran oil or castor oil. (Some also use palm oil, although we don’t because it’s linked to the destruction of rainforests). Another crucial difference is that traditional soapmaking produces glycerin as a by-product of the saponification (soapmaking) process. Glycerin is a humectant, which means it attracts moisture. Use a handmade soap, and it’ll leave your skin soft and hydrated. Commercial producers take the glycerine out to put in other products like lotions and creams. That’s why people say that soap dries their skin, and has that tightening feeling – they are talking about commercial “soap” which as we’ve seen, isn’t a soap at all. It’s why you use body lotion afterwards, because the commercial stuff has stripped the moisture from your skin. Traditional handmade soapmakers use skin-loving ingredients like shea butter, cocoa butter, mango butter and oils. Many, like us will add herbs too, because either they are natural colourants or for their therapeutic properties; clays, oatmeal, honey and aloe vera to the mix. Lauric Acid/SLS – foaming agent dissolves oils on your skin so water can rinse them away – but also means that your skin’s natural oils disappear too. Sodium Tallowate – tallow or beef fat which has been saponified. It’s very cheap to use, not particularly cleansing but is a good base. SodiumLauroyl Isethionate – a detergent, made in a laboratory, which cleans by dissolving oils so water can rinse them off. This includes the skin’s natural oils. Stearic Acid – makes the bar look shiny and used to harden the bar. Sodium Palmitate – Palm oil and lye. Palm Oil is used to give a fluffy lather, and a hard bar. It’s also cheap to use when compared to other products such as olive oil and shea butter. But too much of it in a recipe can be drying. It’s true there are some oils in these “beauty bars” – like palm and coconut – but it’s impossible to tell how much without knowing the recipe. But there’s an awful lot of synthetic detergents in there too.